And here I was, only just saying how good Crusader Kings II - nominally a strategy game - was at depicting inter-personal relationships. Guess I'm not the only one who digs that aspect of the game, because developers Paradox are now going to double down on it, announcing an expansion that's all about role-playing. 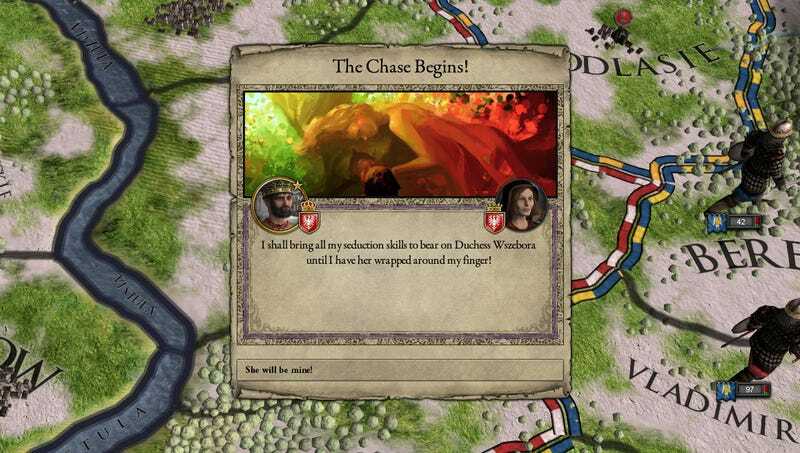 Crusader Kings II: Way of Life is "a project that will allow you to get even deeper into the role-playing aspects of the game", by giving you "more power over personal relationships than ever before". "Sure, it's nice to have someone cozy up to you and be your lover while you're sitting atop the throne", the announcement on the game's forums reads, "but what if you could choose who to seduce? Or, after getting into that relationship on the side, what if you discover that you just need some space and had a way to break it off? You know, without having your soon-to-be ex-lover assassinated. These things and much more, including hundreds of new events, are coming to Way of Life."